This week, one of my Facebook followers asked me for tips for learning centers. One of the best places to get ideas for running centers is at your own school. Ask your colleagues if you can come and observe them during center time. Sometimes your administrator will give you a half day sub to do this, if not you can observe during your planning period. Colleagues are great resources because you can ask them all the nitty-gritty questions of what works, what doesn’t work so your centers will run smoother. Through the years, I’ve tried different ways to manage centers. At times it felt like the centers were managing me rather than me managing them. But, I finally settled on this format for language arts centers. Language arts block begins with a whole group lesson. There is usually some extension assignment that goes along with my whole group lesson. Students go back to their tables (5 tables in all ) and begin the extension assignment. Each table has a captain (the captain changes each day). The captain gets the center tub that is assigned to their table at this time. Once everyone is settled and working on their assignment I begin calling one group at a time to work with me at my reading table. Students who are working on the extension assignment at their table will finish at different times. When they finish with their assignment, they turn in their assignment and begin their center assignment. Their center assignment is in the center tub that the captain brought to their table earlier. 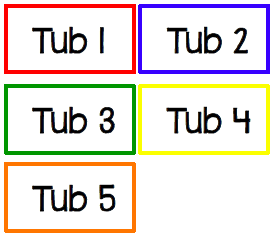 When they finish with their center assignment, they begin their second center which changes each day like the center tub. The second centers include: computer station, listening station, reading with a buddy, word work, and independent reading. This center system works great if you have a small classroom or a regular size classroom that is overflowing with students. You know the old saying “if the mountain won’t come to Muhammad then Muhammad must go to the mountain”? It works that way with centers, too. My centers had to come to my students because there wasn’t enough room for my students to go to the center because there wasn’t room to set up permanent centers. These are signs that you can use to remind students what they need to do. 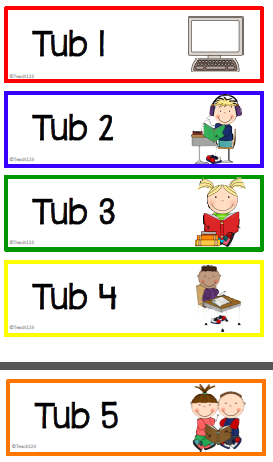 On Monday table #1 would do tub #1 center assignment. When table #1 finishes their center tub assignment, they would go to computers. On Monday, table #2 would do center tub #2 assignment. When table #2 finishes center tub #2 assignment, table #2 would go to listening center. Each day the signs would rotate to a new table. These are signs you can attach to your center tubs. Click HERE to download these freebie signs.